YACOLT – A Larch Corrections Center senior manager has been recognized for her work in supporting the needs of employees who have served in the military. 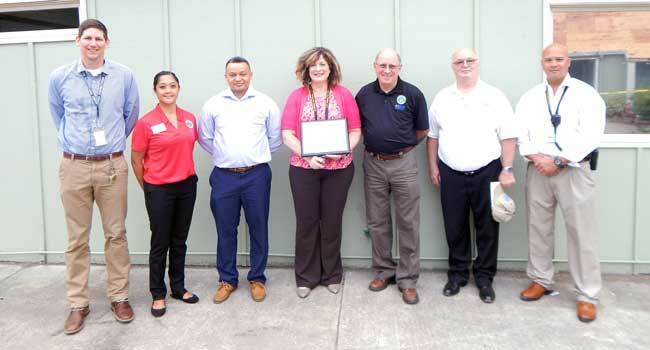 Superintendent Lisa Oliver-Estes received a Patriot Award from the Washington Employer Support of the Guard and Reserve (ESGR) on July 27 after being nominated by Joseph Agloro, corrections specialist 3 and serving member of the National Guard. The ESGR is a Department of Defense program that promotes cooperation and understanding between Reserve Component Service members and their civilian employers to help resolve conflicts with an employee’s military commitment. The Patriot Award is given to supervisors who have made an extraordinary effort to support employees who have served in the military. Examples of employer support include flexible work schedules, time off prior to and after deployment, caring for families and granting leaves of absence, if needed. Larch Corrections Center currently has six staff who are currently serving in the military, and several more employees are veterans, according to Heather Williams, the facility’s public information officer. Oliver-Estes has worked for the DOC for over 25 years. She began as a mental health counselor at the Washington State Penitentiary and has held positions of unit manager, captain, and correctional program manager throughout her career. She has been a superintendent since September of 2015. For more information on the ESGR, visit www.ESGR.mil.